Much to the delight of their fans, Australian punk rockers Antiskeptic are back after a six-year hiatus with a brand new album, Stare Down the Ocean. The band’s lineup may have changed from a three-piece to a four-piece but Antiskeptic 2.0 haven’t lost the brutality and inventive musicality of their previous albums. I sat down this week to speak with lead singer and founding member Andrew Kitchen about reforming after such a long break, saxophone solos, and what it’s like being a Christian in a band that doesn’t fit the Christian music mould. SAM: Andrew, your first album after reuniting as Antiskeptic dropped last week. What’s it feel like to have a new album out? ANDREW: It’s pretty surreal. I basically signed off and that part of my life was done. The biggest musical experience of my life was behind me in 2008. And now 2014, we’ve reformed with a new line-up and a new album, and it’s like, ‘What? I get to throw the hat in the ring again? !’ It’s an amazing thing. People have been saying ‘What do you hope to achieve out of this season with Antiskeptic?’ and I’m like, ‘We’ve reformed, we’ve played shows, and we got to record a new album!’ That’s it! It’s amazing considering that I thought we were done for good. I’m just so thankful for everything that has happened. I’d like to think that these songs mean a lot to a lot of people when they hear them and they want to come and check out the band live and engage with the songs live, but the fact that these songs exist and that we got to work with Forrester Savell and have a record that looks and sounds as good as it does – that’s something that we really want to celebrate and recognise. Absolutely. What have you been up to over the last six years? I’ve had three kids! [Laughs] I’ve renovated a couple of houses. I’ve worked with youth, and inspiring young people to consider questions of faith and relationships and identities and role models in schools all over Victoria [Australia]. So I’ve been pretty busy. This year I’m spending time with my kids and getting involved in an array of musical and other projects. It’s an amazing lifestyle that I lead, I’m very, very blessed, and Antiskeptic is probably one of my biggest focusses at this point in time. Wonderful. Now you crowdfunded this new album, Stare Down the Ocean, which I guess wouldn’t have been a thing six years ago! What was the process like making an album that way? It takes a little bit of soul searching, because if we aim too high and we don’t hit our goal then we don’t get any money. But if we aim too low maybe people will think, ‘Well, they’ve hit their goal in the first three days…’ So how do you gauge what figure you set? So we just said that we wanted to record an album. Initially we had a far more basic idea for how we would fund and record an album and it was a much smaller budget. Basically the position would have been to record an album and just play an album show and start to claw our way back. But our vision has grown and grown and grown as things have become possible. We aimed for $2,500 for our first Pozible campaign to record the album and we got $6,500. Then, lo and behold, 50 or so hours of grant writing and we managed to achieve a Arts Victoria grant which – I had to read the letter eight times! ‘I am pleased to inform you that your grant has been successful’. I was like, ‘Dammit… Hang on! I am pleased… to… inform… you… that your grant application has been successful. What does that mean?’ So it took a few moments to sink in. I rang Nick and was like, ‘Dude, we’ve now got $14,000! So what’s possible with that?’ We rang up Forrester and took it from there. Then we wanted to shoot a second video clip for our song When the Night Comes In and Nick had the idea to run another Pozible campaign. We aimed for $6,000 and got $17,300! There was more support from our fans than we realised. That made it possible to cover a multitude of things. The PR campaign, the second video, and a host of other things as well. We were amazed. This fan-funding thing is so immediate, so engaging and creates such a great connection between yourself and the people that support you. The band’s lineup has changed over the last few years – you’ve gone from a three-piece to a four-piece. How has that changed the way you play live and record? I think that there’s less pressure on me when we play live. I’m not much of a fan of a three-chord basic structure and so I’ve almost tried to demand more of myself out of my songwriting. So on the live stage, it’s like, there’s three guitar parts underneath that part of the song, I’ve got one set of hands, so it’s amazing to be able to share it round which we’ve never been able to do live because we haven’t had two guitars. And Jarrod has brought so much lead guitar riffery – he’s a natural shredder and a far better guitar player than me. That’s just opened up a heap of musical options actually. Something that I’m hoping to take to the next level when it comes to recording and writing more songs. I guess when Jarrod joined the band, most of the songs were 95% there, but somehow his guitar playing added much, much more. Structurally, the songs were pretty much done. Given that Jarrod has a lot of achievements in his songwriting in previous bands, I can’t wait to write with him more and more. Tavis, our bass player, is an amazing musician himself too. Has having the six-year break changed how you approach being in the band? Yeah, I guess one thing that we didn’t do well in the first stint of the band is that we didn’t take time off. We just kept rolling. We didn’t say, ‘January to March next year, we’re not booking any shows or rehearsals or whatever’. We should have blocked out time away from the band, and let my mind marinade in an array of books and movies and time with other friends, and work hard on different projects, then come back to Antiskeptic really inspired. We just never took our foot off the accelerator. Downtimes but no official ‘let’s not do anything band-related’. It was always about the next thing – shows, studio, even marketing. So this season is busy at the moment because we’re releasing an album and heading on a national tour, but I imagine getting to a time fairly soon where we go back to the model of: we get invited to play a show, we get together to rehearse a week before, slam it out and go and play the show. And once we need a break, ‘seeya guys!’ There’s not much happening between shows. Social media of course. But because most of us are family men now, and there’s wives and lots of kids in the picture, it can’t be the all-consuming Antiskeptic days of old. Let’s talk about some of the tracks on the record. You’ve said that Hey Dissident is one of your favourite tracks on the album, why is that? I just love that… this will sound like a geeky musician answer… but the verse of the song is in 5/4, the pre-chorus is in 3/4, the chorus is in 4/4, the bridge is in 6/8… So it tweaks my musical interests. I find it really enjoyable to listen to. It’s high energy and punchy and really melodic. It tells a story of a young girl. I get excited hearing that song, it hasn’t grown old on me yet! It’s one of these fun moments of hitting chords and hitting them hard, and finding the movement and the chords fit together really well. It felt great. It was a keeper. Now Andrew, you’re a Christian. The track When the Night Comes In seems to talk about grim realities but you look to the future with that line, ‘There will come a time when we will sing.’ Is this a reflection of the hope you have in eternity? Absolutely, man. That’s what it boils down to. I look around at the horrid things that are happening all around the world, and it’s hard to continue to believe that God is actually the author and creator of life when there’s so much stuff going on. Why don’t we see more interventions of these horrible situations around the world? I just choose to believe because God is at work and there will come a time when his peace will reign and all men and women will know of the one true God and will worship him accordingly. And I’ll Follow – that track has such a brutal beat and a killer riff. How did that song come together? I think on a message level, probably out of a place of frustration with some fellow brothers and sisters in Christ. Saying, it’s not how persuasive our words are, or how much we point fingers, it’s actually about us getting on with our relationship with Jesus, deepening that all the time, and making sure that our eyes are set on him and our hearts are set on him, and that will be a great witness. We don’t need to be high and mighty, but humble daily followers. People notice the scent of what that is and will come asking. How far back do these songs go? Have you been sitting on them for a few years? There’s a whole range in there. There’s some that could have made the Monument EP that we recorded in 2006. One of the songs called Suffering in Silence, The Kids Aren’t Scared, and I Will Follow we released as a bonus track on our live recording from our last gig in 2008 when we finished up. So we never really felt like that song got the attention or the plays that it possibly deserved and it sat well with the rest of the songs that we were writing in this new batch. So it a bit of a cross-section of different years. But that’s typical as an album. You might listen to a fresh album for the first time and in your mind think that the songs were written in the last six months to a year. And that may well be true, but I think it’s more often than not that songs occur to you and travel with you for a long time until they find a home. This album was a great opportunity to give a few of these songs a home, put them on the record and put them out. You’ve said that you hoped to get Kirk Pengilly of INXS playing saxophone on the title track. Was there any chance of getting him to play on the song, or was it a pipe dream of yours? [Laughs] Bit of a pipe dream. I initially reached out to him but didn’t get a reply unfortunately. So yeah, I was hoping for three things on this album. There’d be a key change on a song, a tempo change on a song, and we’re going to get a sax solo. Nick, our drummer, wasn’t so sure about a sax solo, and I said, ‘trust me, I’ve got the perfect song for it.’ I played him Stare Down the Ocean and just to get the idea down, I recorded the lead line that I was imagining on sax on guitar. But Nick thought it sounded great on guitar so we just kept it as a guitar line. Decided. Didn’t get the opportunity to ever meet Kirk Pengilly and have a guy from INXS on our album. Maybe next record. Yeah. It’s got that perfect sound. Really dirty and really hard. It would have been fantastic. What’s your favourite Pengilly saxophone moment? Oh… The sax solo on Love Will Never Tear Us Apart is incredible. The Live at the Wembley video – he’s smashing it and Michael Hutchence is in his element walking around the stage like he ruled the world, which he kinda did at that point in time. A bunch of great musicians in that band, very inspiring. I still remember where I was when I found out Michael Hutchence had died. Looking back over your time in Antiskeptic, you’ve had a lot of indie success. You’ve got Christian fans, you’ve got non-Christian fans. How has it been being a Christian in the music scene? I think we’ve had a certain covering. It’s also how you live in your private life before the spotlight passes over you for however long and however hard that spotlight is shining. I’m not a hard drinking guy, I’ve never done drugs, and I’ve always been way more interested in music than I have been in girls. [Laughs] Also, the fact that I started this band out of selfless motives. I remember thinking back in the day, I was looking to Tool and Silverchair and Metallica and Guns’n’Roses, and asked, ‘Where is the Christian alternative?’ The alternative to the music that I want to listen to that’s written by Christian, not necessarily a Christian band. I looked around and America was spitting out a lot of rock acts but it wasn’t the sound I was liking. I like Guns’n’Roses but the Christian alternative sounded like Nickelback. So I was like, maybe I’ve got to write it? Maybe I’ve got to be that dude? So I had to start writing stuff that sounds like what I would want to listen to but from a Christian perspective. But I’m sure you’re aware, that not every song is about the daily walk in faith. There’s narratives, a range of different songs, even a few heartbreak songs. You’ve got to trust that God’s using you and your words to communicate what he wants to communicate, and run with it… The Holy Spirit is at work speaking through us. I just want Christians to be engaging in the arts and do what they’re feeling inspired to do, because God’s got bigger purposes than what we think that he wants. Sometimes it doesn’t look like your typical evangelism. Play in Reverse, is that a song about past regrets? Possibly? Yeah, a little bit. I just started writing. It’s not just about relationships between a guy and a girl, it can just be about moments in your life where you walked away and gave up. It’s just about living with regret, and needing to move on from the opportunity that you could have taken, or made a difference. Wasted time. It’s about moving on from past opportunities that you thought may have changed the course of your life. And the final track, Reach for the Sun, it has an almost school dance swagger to it, but then it evolves into an upbeat dance track. Why close the album with this song? Just the end section of the song, it’s such a tempo shift – the one I mentioned earlier. It has that instrumental [sings riff]. I wanted to finish the song on a party vibe and so I wrote it in. That song is about my wife and our relationship when we first met. Being together, being us, and all the wonderful and weird conversations you have that are just golden in hindsight. Lovely. Now what’s next for Antiskeptic? Is this album a one-off or are you hoping to be back for good? Nah, back for good. Back for good. We hope to build up an audience base again and reconnect with old fans. Re-establish all the networks and contacts and stuff like that. It’s really great, we have a team building behind us, a few industry people as well paying attention to what we’re up to and what we might get up to in the future. So it’s just a daily process of getting done what needs to be done and enjoying the ride. Onwards and upwards, we just want to write some more songs and get out there even more. Enjoy what it is to walk on stage and play songs that we’ve written and have cool conversations afterwards. That’s what keeps us in the game. And seeing how people are getting behind the crowdfunding, you should be about to fund a few more records in the future. Hopefully. And if we have a successful run of shows around the country, maybe in a year we have enough songs to hit the studio again, and record cheaply in the studio at my house. Pozible might even be our record company! Yeah. Thanks so much for the chat, Andrew and all the best with the tour. 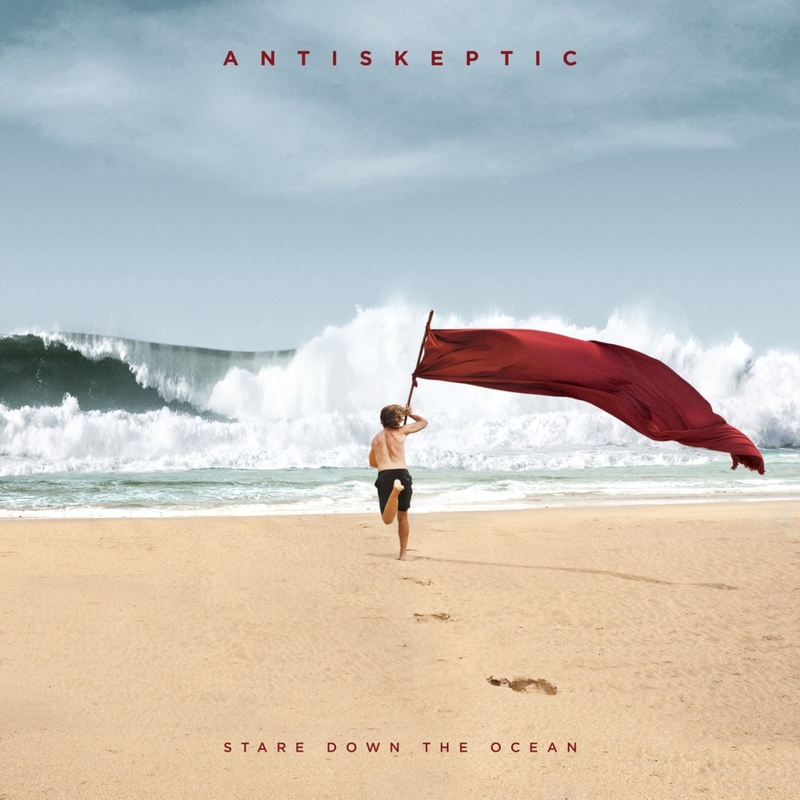 S tare Down the Ocean by Antiskeptic is available now on iTunes. You can catch the band touring Australia over the coming weeks, starting in Sydney this Thursday 25th September. Full tour details can be found here. Posted in MusicTagged Antiskeptic, christian, Interview, Stare Down the OceanBookmark the permalink.